At the end of the first quarter of 2018, general government's net financial assets, i.e. the difference between assets and liabilities, amounted to EUR 132.8 billion. Net financial assets went up by EUR 1.8 billion from the previous quarter, driven by local government. 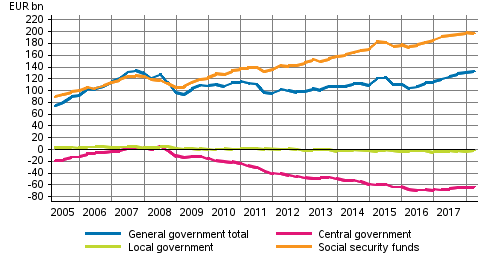 The net financial assets of employment pension funds and other social security funds contracted in total by EUR 0.6 billion, while the net financial assets of central government increased by EUR 0.6 billion. These data derive from general government financial accounts compiled by Statistics Finland. Central government's net financial assets grew by EUR 0.6 billion from the previous quarter's level, being EUR -63.5 billion at the end of the quarter. In the first quarter of 2018, gross recording was adopted for government derivatives. The change in recording caused approximately a EUR 6 billion increase in assets and liabilities. The change in recording does not affect net financial assets. After the effect of the derivative recording has been subtracted from both assets and liabilities, assets declined by EUR 1.0 billion mainly as a result of the drop in the deposit stock, and liabilities contracted by EUR 1.6 billion especially due to a fall in the debt security stock. Local government's net financial assets increased by EUR 1.8 billion. Assets grew by EUR 0.8 billion primarily due to an increase in deposits. Local government's liabilities contracted by EUR 0.9 billion mainly as a result of a drop in the stock of both short-term and long-term loans. The stock of long-term loans was EUR 16.6 billion at the end of the quarter. Employment pension schemes' net financial assets stood at EUR 195.5 billion at the end of the quarter. The stock of quoted shares increased by EUR 1.1 billion mainly thanks to share acquisitions. Share acquisitions were financed with deposits and their stock decreased by EUR 1.3 billion. The stock of derivatives declined by EUR 0.6 billion while the related stock of cash collateral contracted by EUR 0.3 billion. The amount of assets invested in fund shares and debt securities remained almost unchanged. The net financial assets of other social security funds went up by EUR 0.2 billion. ISSN=1798-1964. 1st quarter 2018. Helsinki: Statistics Finland [referred: 24.4.2019].